This Roundtable date is March 1, 2017 at 15:15 - 16:30 local time. 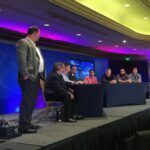 Keith Parsons, Shaun Neal, Sam Clements, Blake Krone, Eddie Forero, Joshua Williams, Ryan Adzima, and Drew Lentz discuss the implications for the machine learning announcement from Aruba Atmosphere 2016. They look at its possible impacts on wireless networking over the next 3-5 years. Moderated by Tom Hollingsworth. Keith Parsons, Shaun Neal, Sam Clements, Blake Krone, Eddie Forero, Joshua Williams, Ryan Adzima, and Drew Lentz discuss the difficulty of the nature of securing wireless networks, and how the immature nature of nascent IoT devices presents further challenges. They also address how application performance within the network presents challenges to wireless network engineers. Moderated by Tom Hollingsworth. 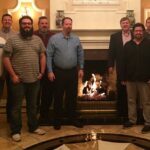 Keith Parsons, Shaun Neal, Sam Clements, Blake Krone, Eddie Forero, Joshua Williams, Ryan Adzima, and Drew Lentz discuss the value of the Aruba Airheads community. They further answer a question about how to build your voice within the greater wireless community. Moderated by Tom Hollingsworth.